Consigned to 2018 Horn Showcase Sale - OCV’d. Very correct young female with her stunning Parker brown color. She comes to you with a bull calf at side born 4/1/2018 sired by Tuff Spirit. She is a blend of Gunman, Butler, Phenomenon and Boomerang CP. All the magic that made Mike and Debbie Bowman so much money in this industry. We have her exposed back to Cowboy Tuff Chex for an exciting 3-N-1 package. Millennium Futurity Eligible. Consigned to 2018 McCombs Spring Sale -OCV - RJF Rio Net Worth measured an outstanding 50.75" TTT at just under 20 months old. She has had several half-sisters sell for over $10,000 and we feel she is the best yet. On the top side JBR Net Worth's dam is mid 90's and a phenomenal producer out of ECR Eternal Tari who is the only cow in our breed to producer 3 over 90" TTT daughters and would have been 90" TTT by now had she not kept tipping a horn. ECR Eternal Tari was at 89.5" TTT fall of 2017. We have her exposed to Garland's R.O.I. 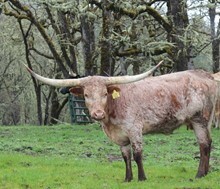 a huge framed bull that is (WS Jamakizm X Texana Garland's Gal). This is a serious heifer for a serious breeder. Millennium Furturity Eligible. Consigned to 2018 Midwest Spring Sale - OCV - This is a young female that it hurts to part with. Her sire CV Cowboy Casanova has done so many outstanding things for our program. Her dam WS Sun Rise measures 87.7" TTT and is a huge framed cow with massive production history. WS Sun Rise is also the dam to the 90" TTT WS Sun Star. Sun Star produced WS Vindicator. We have her bred to M Arrow Mix-Master who carries LCR Buena Joya (80"+ TTT), ZD Delta Slicks Petite (81.25" TTT) daughter of Delta Petite a half-sister to Royal Reputation (90" TTT), as well as Working Woman (80"+ TTT), Shadow Jubilee (90"+ TTT), Day's Feisty Fannie (89 3/4" TTT after taking off some horn), and Delta Van Horne (right at 80" TTT after taking off some horn. As Paul Harvey would say. "And now you know the rest of the story." Millennium Futurity Eligible. Consigned to 2018 Midwest Spring sale - OCV - Chillin Out has been a favorite since she was a calf. We have had several daughters out of her dam, Stocktons Chill and they all have great color, size, milk, and a great layback early twist. She goes back to Archer Texa ( WS Jamakizm x Texana Van Horne). Texana Van Horne was a co-high seller at a past Legacy sale for $59,000. We have her exposed to Cowboy Tuff Chex. This 100% outcross should make for some amazing hy-blood vigor outcross. Millennium Futurity Eligible. OCV - This exceptional heifer was not on the sale list. We had plans on retaining her for in-herd use but Lot one tipped a horn and we wanted to give you the opportunity at just as an exceptional heifer. Her dam is 86.25 TTT and her sire is the $100K CV Cowboy Casanova 84.125 TTT. Her half-sister sold a few years back at the Midwest sale for $25K. We have this powerhouse heifer bred to M Arrow Mix-Master out of Chance 53/13 x M Arrow Dark Shadow bringing Working Woman, M Arrow Shadow Jubilee, Day’s Feisty Fannie and Delta Van Horne into her pedigree. Just imagine the possibilities. Millennium Futurity Eligible. Consigned to 2018 Hudson Valentine Fall Sale - OCV - Talk about a genetic Gold Mine. Her sire produced amazing offspring that are making a huge impact in the industry today. He’s also the Guinness Book of World Records holder for tip-to-tip. He had three daughters sell at last year’s HV sale that generated enough money to basically pay for him. Her dam HL Brickhouse is one of the youngest cows to reach 90" TTT doing so 3 months shy of her 6th birthday. RJF Goldbricker is smooth as silk, great bone structure, and the femininity to be a Victoria Secret model. Left unexposed to breed to the bull of your choice. Millennium Futurity Eligible. Consigned to 2018 Horn Showcase Sale - OCV’d. We are so pleased with the total package of calves that JBR Eclipse produced for us. We sold her 3/4 sister at the Legacy for $18,000. Her dam also produced Outlawed. Not only does she has 3 animals over 96" TTT in her pedigree, she also has Sheza Whip Wr Wil on the dam side. She is bred to Garland's ROI (WS Jamakizm x Texana Garland’s Gal).AND HAS BULL CALF BY SIDE BORN ON 9/13/18. This calf will have 4 over 90" TTT animals in pedigree with outstanding conformation. Millennium Futurity Eligible.